...and when you think of call centres, you probably think of places like India, South Africa or the Philippines; at least that’s where most people think all of our call centres have moved to. However, when it comes to telemarketing complaints, Swansea is in fact the UK’s Cold Call hot spot. This comes as the Information Commissioner’s Office (ICO) recently fined two further companies in the Welsh city. Falcon and Pointer Ltd made millions of automated calls about Payment Protection Insurance (PPI), and Direct Choice Home Improvements Ltd made a number of nuisance calls, subsequently receiving 167 Telephone Preference Service (TPS) complaints. The ICO has now taken action against six companies based in Swansea since 2013. This week Falcon and Pointer Ltd were given a £175,000 fine after the ICO received more than 5,000 complaints about the company’s automated PPI calls. Meanwhile, Direct Choice Home Improvements Ltd, which sells products such as windows, doors and conservatories, was fined £50,000 for receiving 167 TPS complaints over a five month period. The penalties coincide with the ICO’s latest publication on its updated Direct Marketing Guidance (2016), which provides guidance to organisations on what to do to comply with the law and good practice. string of Swansea firms to come to the attention of the ICO. Help Direct UK, based in Swansea, fined £200,000 in 2015 for sending out unsolicited text messages. 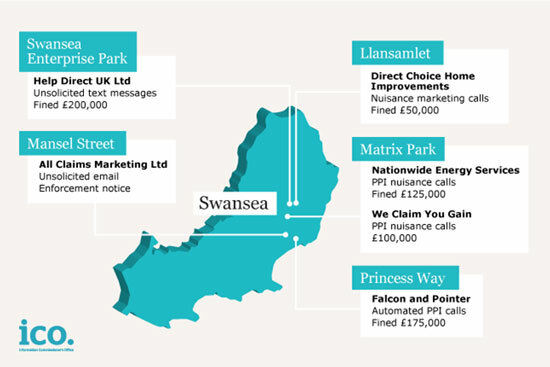 In 2013, two Swansea companies which were part of Save Britain Money Ltd (BBC 3’s The Call Centre) were found to be responsible for 2,700 complaints relating to nuisance calls about PPI. Nationwide Energy Services was fined £125,000 and a We Claim You Gain £100,000. All Claims Marketing Ltd, based in Swansea, was issued an enforcement notice by the ICO in 2014 ordering it to stop its bad practices around sending unsolicited electronic marketing mail. Meanwhile Oxygen Ltd, based in nearby Port Talbot, was fined £120,000 in 2015 for making automated nuisance calls and the Claims Management Regulator (CMR) has also recently taken action against another Swansea based company, Rock Law Ltd who were fined £570,000 for “coercing clients” into making PPI claims.